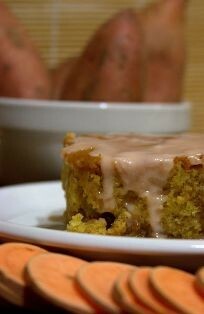 Honey Bun Sweet Potato Cake, a southern classic made with pureed fresh sweet potatoes and spices. Slow baked to a rich and moist perfection. Your choice of homemade butter cream or cream cheese icing. Taste just like Thanksgiving! Honey Bun Sweet Potato Cake, a southern classic made with pureed fresh sweet potatoes and spices. Slow baked to a rich and moist perfection. Your choice of homemade butter cream or cream cheese icing. Taste just like Thanksgiving! Here are our cake sizes and how many people you can serve: Regular-12x9 ( can serve up to 9 people ), Large- 22x13 ( can serve up to 25 people ).